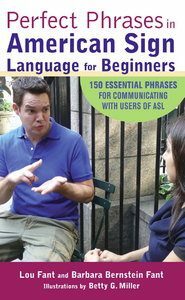 Perfect Phrases for American Sign Language provides 150 essential phrases for hearing-impaired users of ASL and those who interact with them. ASL expert Barbara Bernstein Fant–carrying on the work of her late husband Lou–and illustrator Betty Miller make it easy for you to pick up key signs for everyday communication without having to have prior knowledge of signing. This handy reference is perfect for comfortably and confidently communicating with loved ones, coworkers, patients, or anyone who uses ASL.